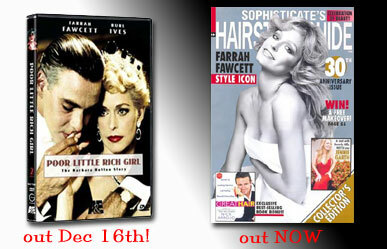 Today, Feb 2 2009 - the heavenly Angel Farrah Fawcett turns 62! We all here at CharliesAngels.com want to send best wishes out to her! Mike Pingel will be in the chat room at 5pm PST. This year super Farrah fan Kiko Chehin wants everyone to remember Farrah Fawcett's Birthday with an 24-hour chat for Farrah fan on her birthday! Everyone can log and meet and talk all about Charlie's heavenly angel Farrah Fawcett on February 2. Some of the questions I never would ask an Angel, like how is your toilet paper hung in your bathroom. Other things uncovered in the interview is what is on her ipod and what one would expect to read in Jaclyn's bathroom. Needless to say - now we all know a bit more than we ever wanted! :) . Check out this new interview with our beloved Kelly Garrett (Jaclyn Smith) by Chicago Tribune's Elaine Matsushia! Mike Pingel will be on hand signing he's books at A Different Light Bookstore in San Francisco this Saturday @ 3pm. Pingel will be signing his newest books: The Q Guide to Charlie's Angels & The Q Guide to Wonder Woman! If you are in the SF area do drop by and say HI! Cheryl Ladd was on hand for the Childhelp USA charity gala held earlier in January. Here are some photos of Cheryl as the center square in the events "Hollywood Square"
Ladd has been one of Childhelp USA's celebrity ambassadors for over 30 years! 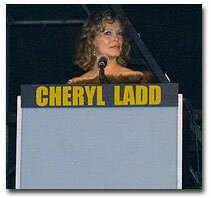 A rare tv clip of Cheryl Ladd signing on The Mike Douglas Show. 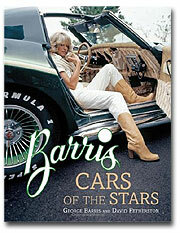 There is a brand new hardback book featuring Farrah on the cover called "Cars of the Stars". 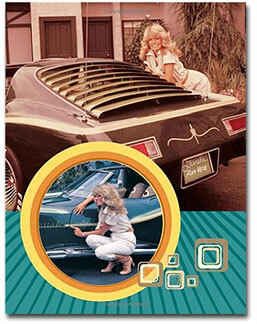 The new book contains four pages of Farrah and her "Foxy Car." Since the 1960s, George Barris has been one of the world's most famous car customizers, creating countless one-of-a-kind custom rides out of his North Hollywood shop. 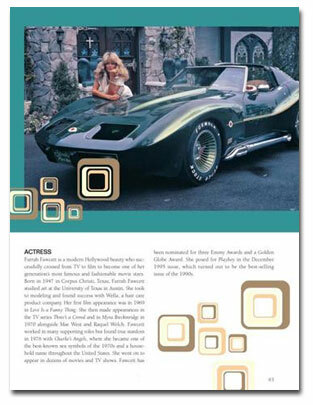 Given Barris's proximity to Tinseltown, it was only natural that when the world's most famous Hollywood celebrities wanted to have their cars customized, they turned to George. 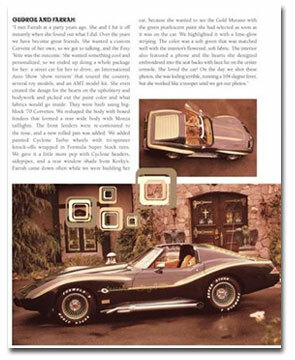 Barris Cars of the Stars features rare images of Barris with his celebrity clients and the custom cars he built for them, along with commentary and stories from the King of Kustomizers himself. 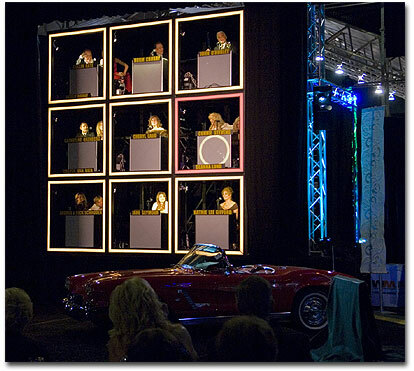 Featured celebrities include such luminaries as Frank Sinatra, John Wayne, John Travolta, Sammy Davis Jr., Farrah Fawcett, Bo Derek, Ann-Margret, Neil Diamond, the Beach Boys, Sonny & Cher and many others. Get ready for 16 months (Sept. 2008 - Dec. 2009) of classic TV mayhem as only the twisted genius of Gay Men Chorus of Los Angeles can imagine. 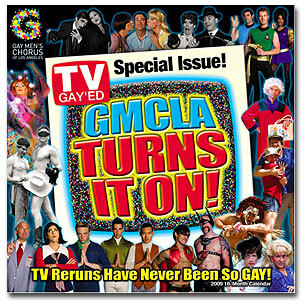 The stunning sequel of the bestselling calendar, GMCLA Goes to the Movies, the Chorus' latest creative effort skews many of America's best-loved retro TV shows with hilarious, high-camp results. They cover Charlie's Angels, Three's Company, Gilligian's Island, Mary Tyler Moore, Bewitched, Dynasty, Star Trek Batman & Robin, The Lone Ranger, I Love Lucy and The Adam's Family. 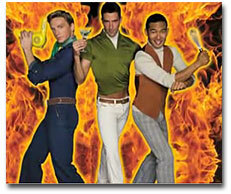 Here are the boys as Charlie's Angels! Here are two new images of Cheryl in Holiday Baggage! All Cheryl Ladd & Charlie's Angels fans should go out this week and see the film! Those who can't go see the film send an email to let them know it you would like it in your city!! If you are in Chicago go to http://www.classiccinemas.com/index.asp to buy tickets! Catch this heavenly Angel on the Dec 15, 2008 cover of Woman's World Magazine on newsstands right NOW. Run down a pick up your copy toady! Yes, TODAY they might not be there tomorrow!!! 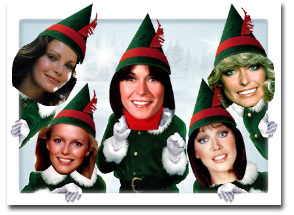 You too can have Jaclyn Smith over for the holidays!. Have an Angel fan on your list this year? Then you must check out these cool items which will shine under the Christmas tree!! Go over to FARRAHFAWCETT.us to buy some new exlusive Holiday only images!! There are six rare All of Me images and three new tshirts! Check it out @ www.farrahfawcett.us. 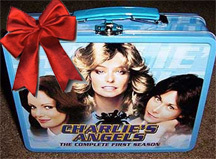 NEW Charlie's Angels LUNCH BOX! This new exclusive fantastic Charlie's Angels lunch box is located at Best Buy!! The metal lunchbox also includes season one of the series for ONLY $19.99. Online you can buy it at www.bestbuy.com and you can find out if your local Best Buy has them in the store. * By the way the site does not have an image of the lunchbox the SKU # is 9107673. 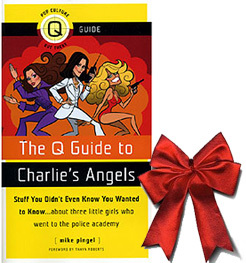 The Q Guide to Charlie's Angels by Mike Pingel. Angel Fan Carlos Aguilar did a new ANGELS ELF Dancing!!! Check it out it's funny!! If you make one yourself, send us your embed code and I'll post it!! Holiday Baggage has it's Midwest premiere on December 10th at Tivoli Theater Downers in Grove, IL. Also opening 12/12 - 12/18 at the Ogden 6 Theatre, Naperville, IL. The film beings after a lengthy absence a retiring airline pilot returns home to finalize his divorce. As his wife and daughters prepare for Thanksgiving, Christmas and the birth of his first grandchild, he is drawn back into their lives. 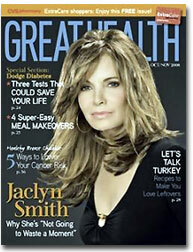 Smith has a new interview in this new October/November issue of Great Health issue. One can even buy a back issue for $6.00! So add this magazine to your collection! On Newsstands Now! The November/December issue of Sophisticate's Hairstyle Guide features Farrah on it's fold-out double cover. Carrie Underwood is on the main cover that unfolds to the Farrah cover. ©1996-2008 CharliesAngels.com - A Fan Site. Click here for Disclaimer.